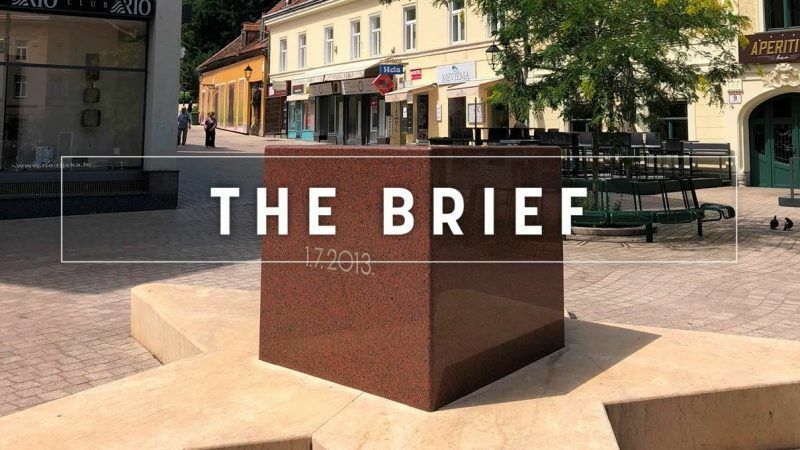 The Brief – EU membership McGuffin? Croatia joined the EU five years ago to the month. But what has bloc membership done for the Balkan nation over the last half-decade? Other than make it possible for thousands of Croats to go and ply their trade elsewhere in the EU? Walking the streets of Zagreb on Sunday, the exact five-year-anniversary of Croatia joining the EU, there was a notable lack of people waving blue flags or celebrating the European project. Even Europski Trg, Europe Square, in the city centre was devoid of anyone other than lunching tourists and locals walking their dogs. Yes, this was the same day Croatia’s footballers were gearing up to take on Denmark and most people seemed busy stocking up on beer and meat for the barbeque, but where were the parades, renditions of Ode to Joy and burning effigies of Nigel Farage? One could argue that as the EU’s newest member, Croatia is best-placed to tap into the recent jubilation of joining the bloc, compared to more established jaded countries where membership is probably taken for granted. Eurostat data tells an interesting story: in 2018, just 36% of Croatians think EU membership is “a good thing”, while 49% think it is “neither a good nor bad thing”. The bloc average is 60% and 25%, respectively. This apathetic attitude is not one shared by the political elite though, who wholeheartedly praise Croatia’s place at the top table whenever given the chance to do so. On Sunday, Prime Minister Andrej Plenković said Croatia had become more “prosperous and just” since joining and lauded the fact Zagreb now has a direct say in laws that benefit or at least affect the country. The former MEP (and rumoured Commission president candidate, if not next year then the mandate after) wants the next five years to cement Croatia’s place among the EU27 and says that eurozone and Schengen membership will happen in that time. Foreign ministry officials also believe that Croatia’s worldwide standing is higher as a result too and that its upcoming stint as holder of the rotating EU Presidency in 2020 will only add to its prestige. So why has EU-fever failed to take hold, even at a time when support is at its highest in 35 years? Maybe five years just isn’t enough to see the benefits yet. After all, while the EU has granted hundreds of millions in funding for various projects, many just aren’t up and running yet. On the cultural side of things, there aren’t generations of Erasmus alumni yet to extol the virtues of Europe either. Five years is one legislative cycle, remember, and a fresh round of MEP elections may jolt people into being a bit less ‘meh’ about being a part of the club. How quickly the wheels come off the UK after Brexit will also determine how fast those Eurostat numbers change. Jean-Claude Juncker said that Croatia has acted like a true founding member since it joined, but maybe therein lays the problem. The world is unrecognisable compared to the 1950s, so maybe Croatia should start making its own way. Taking things like the Istanbul Convention and press freedom more seriously would be a good start, as would solving the ongoing border spat with Slovenia, which does nothing to quell intra-EU suspicions that further enlargement in the Balkans is a bad idea. Croatia, as an EU member state, is very much a work-in-progress and the undoubted positives of being in the club will trickle down eventually. Maybe expecting more after just five years was too optimistic. MEPs shot down a controversial copyright bill that had the backing of Beatles legend Sir Paul McCartney, meaning work will have to start all over it again. The UN’s environment chief thinks there is enough momentum to solve the plastic pollution problem without a Paris Agreement-style treaty. Slovakia was fined €1m for not dealing with an illegal landfill site. France talks the talk on climate change but, in reality, the will to do anything seems markedly lacking. Non-EU countries will have to make sure their animal products meet new antibiotic rules. Hate daylight savings time? Now’s your chance to do something about it by filling in this quick survey, launched as part of the Commission’s public consultation. It’s the European elections next year and we highly encourage the mayor of Sheffield to run. Lord Mayor Magid Magid has branded Donald Trump a “WASTEMAN” and declared 13 July to be Mexico Solidarity Day. Magid’s London counterpart, Sadiq Khan, gave the green light to a ‘baby Trump’ balloon that will fly the skies of the capital during the US president’s visit this month. Pink Floyd would be proud. Infamous paladin of fair play and anti-cheating advocate Diego Maradona was incensed by Colombia’s loss to England this week. We can only assume that he thought the Three Lions were playing in yellow. Quarter final action kicks off tomorrow with France vs Uruguay and Belgium vs Brazil.